A lovely walk enabling hikers to discover different stages of vegetation, with a stop off at the Cabane de Chazeau, before arriving at the legendary lake. 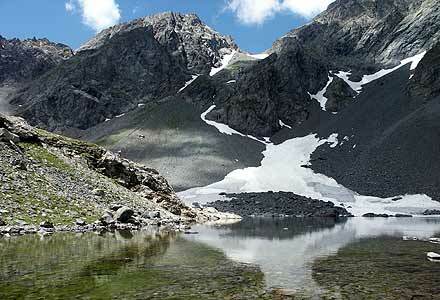 Brave hikers can go for a swim, but everyone will enjoy this magnificent site close to the Grand Pic de Belledonne. Take the D43 to the church in Allemont and turn left up above the village, past Les Crozes and La Traverse. Follow the road along to Coteyssart car park. This circular walk takes you up to the Belledonne lake and is one of the unmissable hikes of the Eau d'Olle valley. The scenery is magnificent and untamed, with lovely panoramic views over the Belledonne mountain chain (Croix de Belledonne and Les Sept Laux), the Grandes Rousses and the Massif du Rissiou. Starting point: Coteyssart car park, above Allemont. From Allemont, follow the Route de la Traverse to the Coteyssart car park and on up to the Cabane de Chazeau, which provides a shelter for shepherds in the summer. The path then goes through pastureland and blueberry bushes, climbing up to the Pas du Bessey. It then goes over a rockfall and up to the lake via some steep switchbacks, before continuing steeply up to the Cabane du Chazeau through a forest of spruce trees, with some lovely views over the Pic Blanc, Pic Bayle and Pic de l'Etendard. The hut is halfway up and always open. The path then opens up, crossing through rhododendron bushes. The start of the walk is in woods, continuing along a balcony path after the Cabane du Chazeau and finishes in a rocky environment. Chamois are often seen on this hike in the summer.